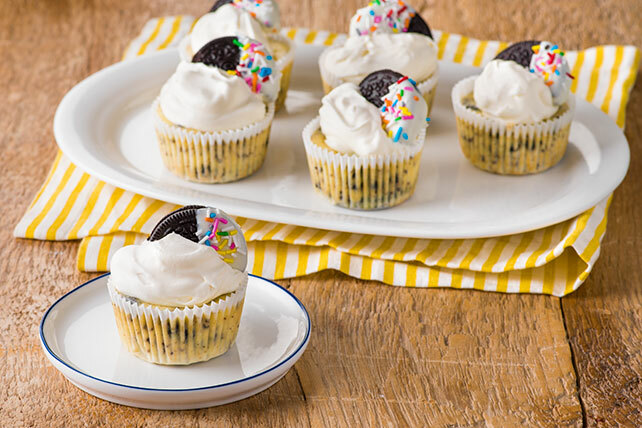 Next time you need to make teeny-tiny servings of scrumptiousness for a festive occasion, remember these Mini OREO Cheesecakes. Place 1 cookie in each of 24 foil- or paper-lined muffin pan cups. Chop 8 of the remaining cookies. Beat cream cheese and sugar in large bowl with mixer until blended. Add sour cream and vanilla; mix well. Add eggs, 1 at a time, beating after each just until blended. Gently stir in chopped cookies. Spoon into prepared baking cups. Bake 18 to 20 min. or until centres are set. Cool completely. Refrigerate 3 hours or until chilled. Meanwhile, cut remaining cookies in half. Dip cookie halves halfway in melted chocolate. Place on parchment-covered baking sheet; top with sprinkles. Let stand 15 min. or until chocolate is firm. Top each cheesecake with dollop of Cool Whip and cookie half just before serving. Cheesecakes can be stored in refrigerator up to 3 days, or frozen up to 1 month, before topping with Cool Whip and cookie half just before serving. If freezing cheesecakes, thaw overnight in refrigerator before garnishing. Instead of topping cheesecakes with coloured sprinkles, top them with holiday-themed sprinkles to celebrate the different holidays.